Psychological projection is defined as a psychological defense mechanism where a person subconsciously denies his or her own attributes, thoughts, and emotions, which are then ascribed to the outside world, usually to other people. Thus, projection involves imagining or projecting the belief that others originate those feelings. The concept of psychological projection supposedly comes from Sigmund Freud, but it just as well could have come from Fox News, The RNC, or any member of the tea party "movement." 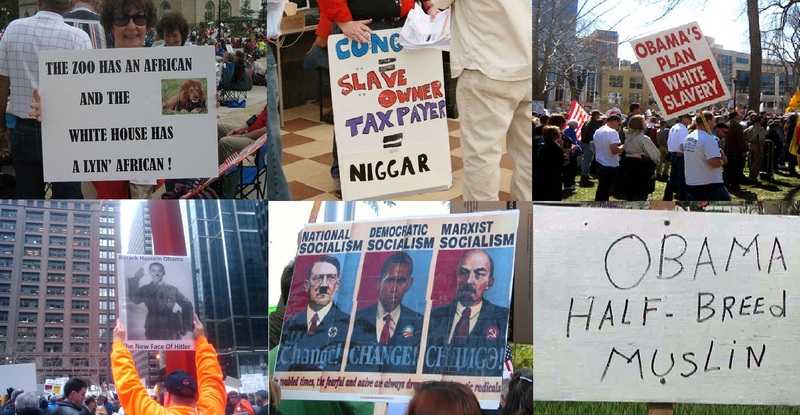 Throughout the first two years of the Republican Party's re-branding of its fringe base as the "tea party," there have been hundreds (if not thousands) of examples of racism among its ranks. No one has said that the movement, itself, is a racist one; however, no matter how many examples of racist signs and/or statements made by tea partiers, the consistent meme from the right has been that there is no racism, whatsoever, in the tea party movement. The level of racism directed toward Pres. 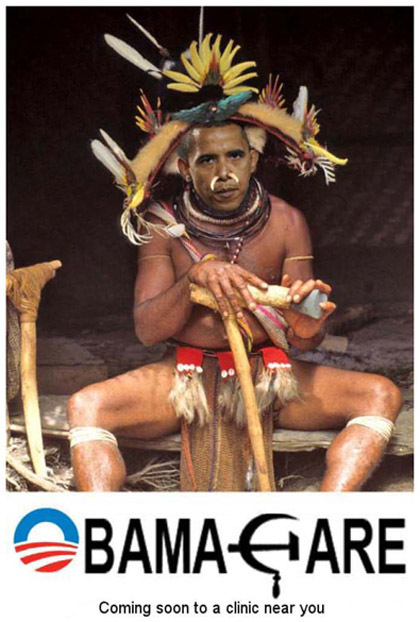 Obama in the early days of the tea party is undeniable, despite the denials from its "leaders." What is also undeniable is that almost all of the non-racial tea party attacks on the president were for things done (or not done) by the previous administration. The deficit was doubled by the Bush Administration (when it inherited a budget surplus). It was the Bush Administration that put two wars on the nation's credit card with a due date of 2009. It was the Bush Administration that reduced taxes on the wealthy while simultaneously starting two wars. It was the Bush Administration that rewarded its cronies with no-bid war contracts that ended up costing US taxpayers 5-10 times more than if those jobs had been done by the US military itself. And it was the Bush Administration whose policies of bank deregulation led directly to the financial collapse of 2008. However, if you listened to the tea party in 2009 and 2010, you would have found them projecting these failures onto President Obama and refusing to acknowledge who was actually responsible. Where was the movement in 2006, 2007, or 2008? Why were they so silent about all of those issues they care about so much? The answer is either partisanship or racism, and the tea party claims it is neither partisan or racist. Flash forward to 2011. The tea party helped elect a number of Republicans to the US House and Senate (giving the Republicans the majority in the House), and brought in hundreds of new Republican state legislators. The economic growth that occurred from mid 2009-late 2010 ceased as soon as the new Congress began implementing its draconian austerity measures, without raising any new revenue. The new tea party Congress took the rather ordinary task of raising of the debt ceiling and turned it into a crisis, forcing the elimination of hundreds of thousands of government jobs and causing the United States' credit rating to be downgraded for the first time ever. Speaker of the House John Boehner (R-OH), in a moment of extreme arrogance, told the media he got "98% of what he wanted" from the debt deal. Clearly, then, the credit downgrade, the decrease in growth, and the increase in the unemployed was the goal of the Republican Congress. How could you interpret it any other way based on Boehner's bragging? A new movement has sprung up over the last month or so. Occupy Wall Street, a loosely aligned, non-partisan or corporately backed group of people who are upset by the high unemployment and record income disparity between the top 1% of Americans and everyone else. The media, unlike with the tea party when it first emerged in 2009, largely ignored the protests in New York. For the first two weeks of the protests on Wall Street (where protesters say the criminals who broke the US economy were rewarded by bailouts and no criminal prosecutions), the media barely covered it. As the protests grew, the media finally did its job and showed up. With only a few exceptions, the coverage was very negative and derisive; it treated the protesters as uninformed children who were not capable of understanding the complexity of what goes on inside our financial system. This is not all that dissimilar to the way the media treated the aftermath of the financial crisis. I can't tell you how many Wall Street "reporters" went on TV arguing against any new regulations being imposed on banking or even salary and/or bonus caps being put on bank executives who received a government bailout. They "earned" that money, according to the media, despite the banks actually losing billions; and hiring new people to replace those responsible for the collapse was largely considered out of the question because, they argued, the financial schemes were so complex that only those who created them could fix them. Thank CNBC for that bit of circular logic being imprinted on the American public. Instead, the financial media (who somehow missed the collapse despite doing all that in-depth reporting) began blaming unions and the government for the collapse. The tea party ran with that line of thinking and used it to attack a president who had been in office for weeks or months at the time. After the Occupy Wall Street movement began to go national, the media started giving it its due. Polling was done that showed that between 60-70% of American support the goals of OWS: increased bank regulation, higher taxes on the wealthy, criminal prosecution of those responsible for the collapse, and more opportunity for American workers. Yet the media's spin on the protests has been that there are no goals at all, and that the movement is "anti-capitalist." Now, after a month of continued protests, and the movement going global, the media has changed its tune slightly. So have the Republicans in Congress and the few remaining tea party people. The right wing in America was very quick to call OWS protesters a "mob" "anti-capitalist" "Communist" and "anti-American." But after an analysis of the protesters revealed that many of the them were former Republican voters, the tone began to change. Rather than embracing the movement for what it is, the right came up with a new meme: the Occupy Wall Street movement is anti-Semitic. The charge of antisemitism is the second attempt by the conservative media to assign some type of hate motive to the protesters. At first, Fox News celebrities like Bill O'Reilly tried to claim that OWS was racist. O'Reilly even claimed there were no African-Americans allowed at the protests. After thousands of photos showed the myriad of ethnic backgrounds of the protesters, this line was dropped. Then came the favorite charge from the right: antisemitism. A right-wing Jewish group called The Emergency Committee for Israel (made up of folks like Gary Bauer and William Kristol - the man who first articulated the idea that Sarah Palin would be a good president) have created an ad claiming the Occupy Wall Street group is anti-Semitic and has ties to Nazis. The right-wing blogosphere ran with it, and has adopted this baseless line of attack to smear the movement. Has there been an occasional "Free Palestine" sign at the protests? Sure. That's not antisemitism, however. Being against Israel does not make one automatically against Jews. Have there been any signs that could be considered anti-Jewish? A handful. But what the right wing media does not tell you is how those bigots were dealt with by the protesters. They were banished. The right also doesn't mention the Occupy Judaism group that held Jewish religious services during the protests and has set up Sukkahs in 12 different cities around the world in celebration of the Jewish holiday of Sukkot. The right also ignores the signs held by protesters that read, "Nazis go home." So, nice try, wingnuts, but no sale. As a Jewish person myself, I know what real antisemitism is. Every Jew does. Fortunately, I have experienced very little of it in my lifetime. But if I watched Fox News, I would think it was Berlin, 1936 in America now. The right has cried antisemitism about Pres. Obama - despite his nomination of a Jew to the Supreme Court, and his first chief of staff and top political adviser being Jews - and the Democrats for the better part of the last two years. Newsflash, righties: Jews are overwhelmingly Democrats and overwhelmingly liberal. 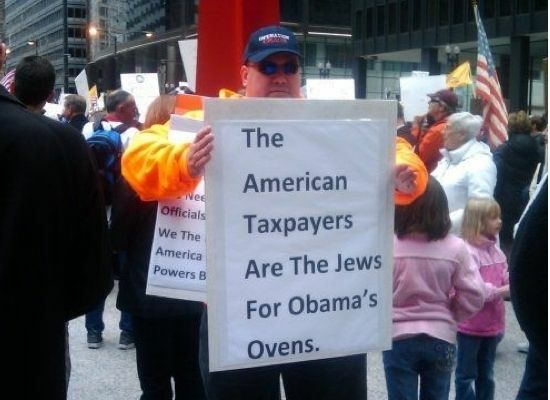 More Jews voted for Obama than John Kerry and Al Gore. This is a stupid and pointless attempt to divide people. I have no idea how long OWS will last or if it will become, for Democrats, what the tea party was for Republicans. The Democratic members of Congress have been reluctant to fully embrace OWS, which is typical of their political cowardice - they don't understand who their friends are and who their enemies are, and they constantly try and appease the Republicans. I hope this sad trend of the last decade and a half will end now that the people are making it so easy for them. Do you support 1% of the population to the exclusion of all others? Or do you stand with the other 99% of Americans. I think the choice is clear. That's a nice piece of writing, Dave. Very well-said! The right wing, especially the new branch of it that will do anything to preserve power for the wealthy, is desperate. They will do whatever they can to keep the OWS movement from gaining steam, and to preserve their status quo. The right is in total denial. All they know how to do is run negative, dishonest political campaigns. They have no idea how to govern, and they have little more than contempt for the American people.